If the Hunger Artist is remembered at all in the United States it is perhaps only because of that great Czech writer, Franz Kafka. In his short story, A Hunger Artist (Ein Hungerkünstler), published in 1924, Kafka's performer finds himself performing at the circus in the twilight of his career. He discovers that the public is no longer interested in the art of starving oneself for the entertainment of the masses. Long before late-19th and early-20th century "Hunger Artists" like Tanner, Papus and Succi roamed the carnivals, fairs and Variety theatres, a slew of predecessors paved the way. Most European countries had their own fasting wonder. Their main show activity was lying in a bed, slowly dying of hunger while the masses crowded around them. Most of these people claimed to have been fed by God. In the U.K. Martha Taylor (17th century), Ann Moore (19th century) and the Welsh “Fasting Girl,” Sarah Jacob (19th century) earned their living, living on air. In Austria the 50 year old carpenter Wolffgang Gschaidter lay starving for more than 15 years (17th century) and in Switzerland Apollonia Schreiert fasted her life away (17th century).1. Bernard Cavanaugh reputedly fastened for more than 5 years until he was convicted for being a hoaxer and vagrant. Even in prison he didn’t eat: “the surgeon of the prison has signed a declaration that Cavanaugh has never touched, since the 29th of November in 9 days time, food or drink, despite this he stays healthy in body and mind.” 2. Francisco Cetti (late 19th-early 20th century) was a Norwegian, 3. who exhibited himself in Berlin in 1887 but during this fasting session he quit after only 11 days. 4. A fellow Scandinavian was Mrs Christensen from Denmark who had to leave the London Royal Aquarium after 17 days instead of the 30 days she had planned.5. The most well known fasting wonder and the main inspiration for the late 19th century revival was Dr. Henri Tanner, an American. 6. Another American was the wealthy Brooklyn resident Austin Shaw who did it because he wanted to-- he had read it in a book. 7. The German fasting wonders also had a long history of survival on divinity. The oldest known case was the wonder girl Margarethe Weiss of whom a pamphlet exists from 1542. The “Daughter from Cologne” exhibited herself in a tavern in 1595. Another famous fasting wonder was Eva Vliegen (17th century). March 1822 hasn’t drunk anything. Many think she has passed away. Meanwhile she has in 1826, a report was made by a medical commission regarding her, the result of which was celebrated her 66th birthday and her continuous existence can be seen as a miracle. People will recall that that Engeltje van der Vlies was watched for 4 weeks by 4 trustworthy persons around the clock, and they declared under oath that she hadn’t eaten anything, food nor beverages. "Many persons have doubted the report that we’ve given a couple of days ago regards the girl, Engeltje van der Vlies, living in Pijnakker near Delft, in Holland, who hasn’t eaten for more than 32 years. We can insure our readers that the whole history is very true. 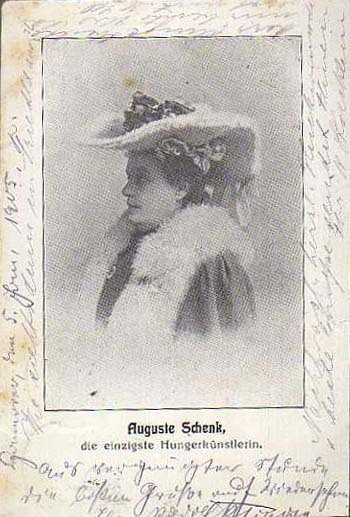 A person who has even talked with this miraculous girl, gives us the following information:"
In 1905 most of the fasting wonders were man, however there was one woman who billed herself as “Auguste schenk the only female fasten artist”. More recently there was Therese Neumann (20th century). In 1926 there were Fastello and Harry a fasting duo who performed there act in a Berlin pub, what better a place to fasten and drink nothing then in a pub. It was in 1926 that a real boom took place, other Fasters in 1926 were Jolly and Max Michelly. with the final chapter in Germany told by "Heros," real name Willy Schmitz, who performed until the 1950's. His most famous feat was a performance in the Zoo of Frankfurt, where he stayed in a glass cage for 56 days. 8. Belgium has had very few examples, though the most famous one was Louise Lateau who fasted for 12 years and then died in 1883.9. Earlier an 18th century woman was carried around on a carriage, forced to pray for mercy in front of the churches in Antwerp, Belgium.10. In 1886 a man from Brussels, Mr Simon also wanted to go for a world record of fasting but quit after a mere 12 days. 11. Early 1900s there was also Carlo the mysterious tattooed fastner who had a postcard made when he did his stint at the rue de la colline in Brussels where he fastened for 20 days and nights without drinking or eating and he was visible all the time. The event took place in 1906 from 22th of october 10 till november 10th. In France there was Papus (19th-20th century)12., Alexander Jacques (early 19th-late 20th century), and Jeanne Balam (17th century). In the North of France there was Charly Flancain who spend his fasting feats inside a coffin. According to one of his postcards he did his “experiences” inside the coffin. Italy had three 19th century fasting wonders— Merlatti,14. 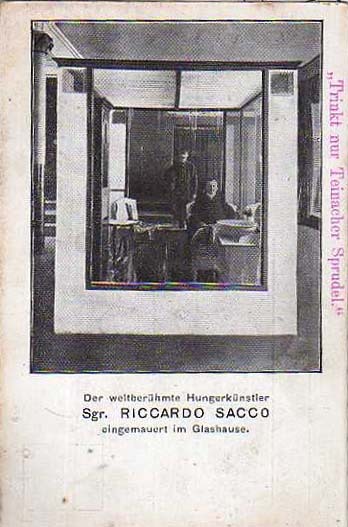 Succi and Ricardo Sacco.15. In Holland there were the performers Maria van Dijck(18th century), Barbara Kremers (17th century)16. and Engeltje van der Vlies(19th century). But of all the Dutch fasters, Engeltje van der Vlies was perhaps the most famous. Below we will look at her through the eyes of the contemporary press, and see her compared with many of her fellow hunger artists. Fraud, Religion, and Medicine: Motives of the "Fasting Wonders"
Why did they do it? Some of them probably really did it out of faith, but in most cases profit was the reason behind it all. If you wanted to visit such a miracle, whether it was in a tavern, a fair or at their house, you had to pay. "The Fasting Wonder of Tutbury," Ann Moore, for instance, managed to collect 400 pounds in the beginning of the 19th century. For a woman who used to be sustained by alms this is a huge sum.17. The Belgian, Mr. Simon claimed he did it for humanitarian reasons. Simon explained that his fasting was as an example for miners who might be trapped in a mine cave-in— showing them that they could stay alive a lot longer without food. The fact that he would earn a nice salary of 5 Franc performing also helped things along.18. At one point in time Succi started a 40 day fast, saying his cash-flow was low, and he needed to acquire money and lots of it.19. Not all miracle fasters had a religious background. Some did their deeds for reasons of health, and others did it because it was their job. The American Henri Tanner wanted to prove that one could keep on living without food for a long time and performed in Clarendon Hall in New York. For 14 days he lived without food.20. In a way he was a trendsetter because many followed his lead. His most famous contender was the Italian Succi. The religious aspect of fasting was for a long time en vogue. Engeltje had been granted her powers for survival by divine intervention. She wasn’t the only one. The same was claimed by Martha Taylor, Eva Vliegen, Louise Lateau, Therese Neumann, and Wolffgang Gschaidter. Louise Lateau for instance was seen as a Saint and even relics were made of her. 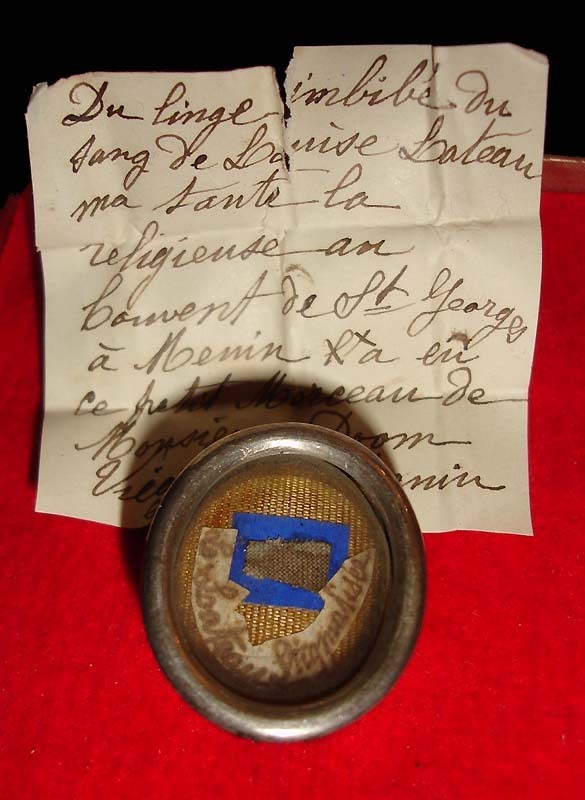 We recently purchased a relic from the Latter, a piece of cloth which had been in contact of her blood. 22. In some cases the viewer was given a show, but most of the time the fasting wonder just lay there dying. However, most of the time the faster told his or her story to the visiting public. The Austrian Wolffgang Gschaidter was even promoted as the symbol of the city Innsbruck and the public was invited to come and see him at the local church and give an alm. (‘Makes me wonder about the weight of the people from Innsbruck’). Another important element was that many invited doctors to prove the public that their “wonderous condition” was real. This the fasting wonders shared with many other types of “exhibited people”. Engeltje, Henri Tanner, Succi, Martha Taylor, Sarah Jacobs, Francisco Cetti all were examined by the medical profession. Mr. Simon had both a dentist and a medical Doctor at his side during his performance, as well as 45 other people who had to watch that he didn’t do anything fraudulent. The only strange thing is that Cetti gained weight during his performance and was exposed as a fraud which brings us to following paragraph. Germany.23. Succi as well as Tanner were also accused of fraud during their long careers.24. Sarah Jacobs died before they found out the truth. Many exhibited freaks and human oddities were the result of "Maternal Impression" according to literature and advertising which accompanied their exhibition. In the case of Engeltje it was her mother's fear resulting from the capture of her brother.25. It is not known whether other fasting wonders used the "Maternal Impression" explanation to highlight the reasons behind their condition. However such a miraculous shock did add to the attraction of these performers and could help explain to the audience in a "scientific" manner why the act chose to take this path. The fasting wonders also sold pamphlets just like many other exhibited people. Martha Taylor, for example, had Thomas Robbins, a balladeer, write and publish a pamphlet about her claiming that she had fasted for more than 40 weeks through divine intervention.26. Did they really eat or drink nothing? In most of the cases they did drink. Succi for instance used a special potion which probably contained some kind of narcotic.26. If you look at the postcard on top of this page you will see that he promoted some kind of “sauerstoffwasser” or oxygen rich water called Ozonin. Other were real frauds, and others only drank water to avoid drying out. Especially those who exhibited themselves for medical purposes. Looking back at our miraculous brethren and sisters, we can say that most of them were people who were in need of attention, whether it was for financial reasons, religious or medical. This need for attention is an important incentive, as we turn on the television and discover that the fasting wonder still exists. Gandhi as well as many other used it as a way to attract attention, and to gain their political goals. In April 6, 2005 when I turned on the my televison I heard the story of 30 Kurds who had barricaded them in a church and were fasting. In 2003 british artist David Blaine fastened for 44 days in a glass container. And in Belgium for many years there was “Studio Brussel music for life” an initiative from the Belgian radio executed by Belgian dj's who fastened for a limited time in order to gain awareness for a specific Charity. A similar event took place in Holland. 1. Allegaert,P., Cailliau (red), Vastenheiligen, wondermeisjes, en hongerkunstenaars, Een geschiedenis van magerzucht. 6. Gould, G,.M., W.L., Pyle, Anomalies and curiosities of medicine, New York, Julian Press,1956. 8. Allegaert,P., Cailliau (red), Vastenheiligen, wondermeisjes, en hongerkunstenaars, Een geschiedenis van magerzucht. museum dr guislain, Gent, 10/24/1991 - 01/19/1992. 10. Allegaert,P., Cailliau (red), Vastenheiligen, wondermeisjes, en hongerkunstenaars, Een geschiedenis van magerzucht. 13. Gould, G,.M., W.L., Pyle, Anomalies and curiosities of medicine, New York, Julian Press,1956. 14. Gould, G,.M., W.L., Pyle, Anomalies and curiosities of medicine, New York, Julian Press,1956. 16. Allegaert,P., Cailliau (red), Vastenheiligen, wondermeisjes, en hongerkunstenaars, Een geschiedenis van magerzucht. 17. Allegaert,P., Cailliau (red), Vastenheiligen, wondermeisjes, en hongerkunstenaars, Een geschiedenis van magerzucht. 22. Allegaert,P., Cailliau (red), Vastenheiligen, wondermeisjes, en hongerkunstenaars, Een geschiedenis van magerzucht. 24. Gould, G,.M., W.L., Pyle, Anomalies and curiosities of medicine, New York, Julian Press,1956. 26. Allegaert,P., Cailliau (red), Vastenheiligen, wondermeisjes, en hongerkunstenaars, Een geschiedenis van magerzucht. 27. A mocking report of this potion, which could be bought by everyone, was published in “L’Illustration” from 4/06/92, p. 486.